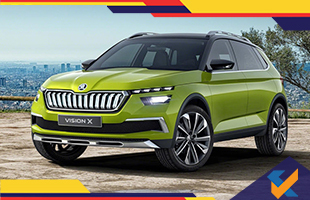 Skoda has quenched the excitement of people with its revelation of the new Skoda Vision X SUV concept. The car is to be exhibited in the coming Geneva Motor Show. Skoda has targeted the likes of Volkswagen T-Roc as well as Seat Arona. The SUV is to be placed under Karoq and Kodiaq which have already been on the sale. As it was presented, the experts acknowledged its design and appearance. According to the makers, the car is expected to be the next step in SUV design. However, it would take a while before one can see Skoda Vision X on the roads. Talking about the car, the new Skoda Vision X is sculpted to meet the requirements of an urban lifestyle. It is also meant to target the urban audience. The Czech makers have stated that the car has various things to offer which include agility, versatility and driving comfort in urban traffic. Falling into the category of urban crossover vehicle, the SUV is the third in the line as mentioned, just after Karoq and Kodiaq. Talking about its physicality, the car has the measurements of 4255 mm in length, 1807 in width and1537 mm in height. The car possesses a wheelbase of 2645mm. Moving further into the details and features, the new Vision X styles in crystalline design philosophy, which has been consistent in most of the company’s vehicles. The character line runs as far as the rears, initiating from the headlights. The butterfly grille, which is the signature design, with double vertical slats features in front. The Skoda logo in front is highlighted with backlighting. The front also bosses two LED DRLs along with LED headlamps. The car also features LED tail lamps, sculpted tailgate along with 20-inch two-tone alloy wheels. The wheels have a 3D design in them. Matching the levels set by exterior design, the interiors are equally crafty as well as stylish. The inside comes with a contrast stitching. Adding on to the futuristic design, the car has the latest infotainment panel along with connectivity features. The SUV provides digital platforms like Smart Parking, HoppyGo, CareDriver and others which are capable of giving services like direction to available parking space and offering car for rental. The car sports 1.5 –litre G-TEC turbocharged four cylinders engine which can be run on Compressed Natural Gas. It can deliver up to 128bhp with 200 Nm of torque.